In part three of our previews, we take a look at the history of the Dakar Rally. The Dakar Rally was the dream child of Frenchman Thierry Sabine, who rode the Abidjan to Nice Rally in 1977 and got lost in the Libyan Desert. He was defeated but fell in love with the beauty of the desert and wanted as many people as possible to see the sights he’d seen in Africa. A year later the Paris to Dakar was born. The first rally in 1978 was seen as more of an adventure than a race, only had 170 competitors starting in Paris and travelling 6210 miles through Algeria, Niger, Mali and Senegal. The first winner of the bike class was Cyril Neveu aboard his, now iconic, Yamaha 500XT. The first years were met with instant success and by 1980 manufacturers such as Yamaha and BMW were entering factory teams plus the number of competitors had already moved up to 216. The Dakar also has a dark side as well. 48 competitors have died in the Dakar Rally’s 30 year history, the most recent being South African debutant Elmer Symons and Frenchman Eric Aubijoux, who suffered a fatal heart attack ten miles form the finish line. In 1986 the number of entrants soared to 603, while the event nearly perished in 1993 when only 154 competitors enlisted. 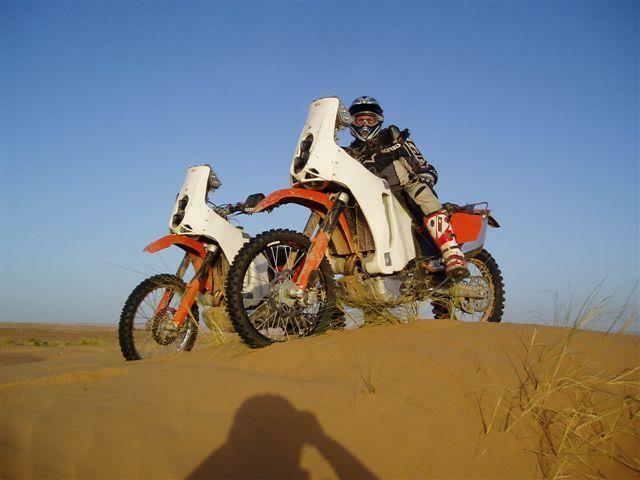 Since then the Dakar has grown year on year and 2008 will see no less than 550 teams competing. And although both the name and the routes have changed, the spirit of the original event lives on.